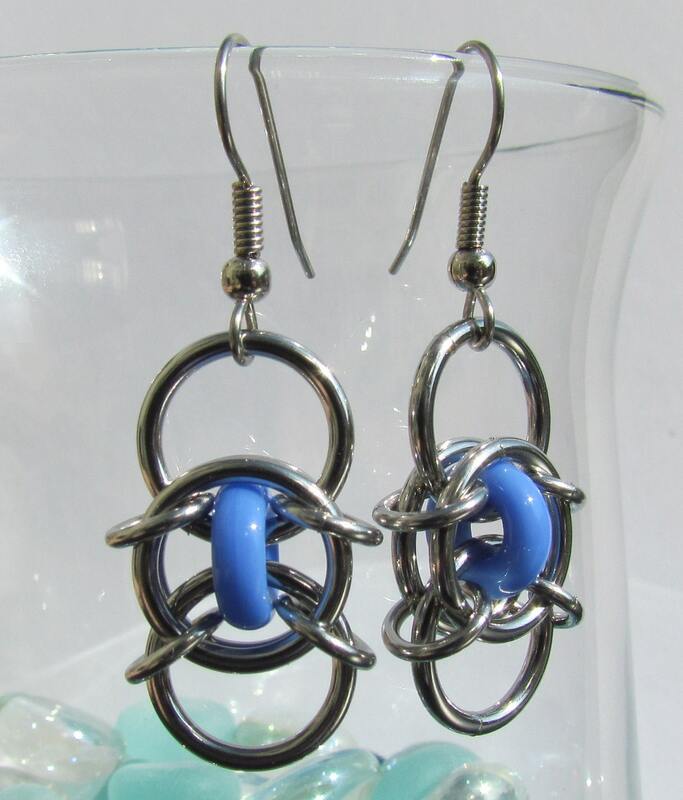 This pair of chain maille earrings is made out of opaque light blue glass rings and stainless steel jump rings. They look great with jeans and just about anything else, and are the perfect addition to any wardrobe! Each glass earring is approximately 1 3/4 inches long (from the top of the earring hook to the bottom), and 5/8 inches wide. The earring hooks are made of surgical steel. These earrings have a nice weight to them since they are made with stainless steel jump rings. You know they are there, but they are not so heavy that they are uncomfortable. Stainless steel is a very durable metal that is highly unlikely to tarnish and easy to clean. All you need is a little mild soapy water and a soft cloth. It is also very strong, so the rings can be difficult to work with. It is my favorite material to work with, however, due to the fact that these rings are very unlikely to bend or come apart. Please check out the rest of my shop as well!